1. 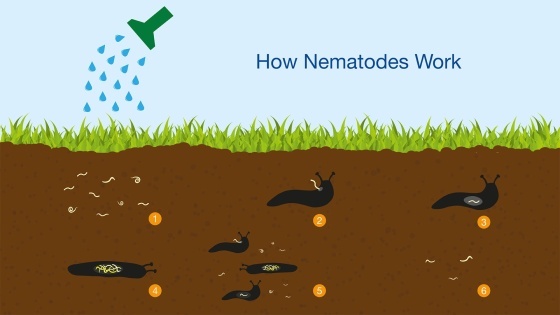 Nematodes can be applied using a garden hose or watering can. 2. After application our specially selected nematodes attack the larval stages of the pest and slugs by entering natural body opening or by penetrating the pest cuticle directly. 3. Once inside, they release bacteria that stops the pest from feeding, quickly killing the pest. 4. They do not stop there. The nematodes reproduce inside the dead pest. 5. They release a new generation of hungry nematodes, which dispense to hunt down further pests. 6. When nematodes can no longer find a host pest, they will die back to their original numbers. The more pests there are, the better nematodes perform.